This multi-lesson unit is designed for the High School teacher, be that teacher a History Teacher, BD Specialists, Inclusion Specialist, or other Special Educator, teaching students who are studying United States History I. It can be adapted to address the needs of many academic level students or classes of students. It offers ways the teacher can address the various learning styles of his or her students. 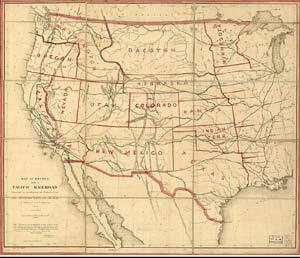 The focus of the unit is the Kansas – Nebraska Act of 1854, other events leading to Kansas-Nebraska, and the impact of slavery on the development of the new territories of the United States as well as its impact on the start of the American Civil War. It will focus on the cause and effect of several events and how they came about. Each lesson is designed to make this part of American History real, that is to show the student that the events are not just lines in a history text book but involved real people and places and the ideas of people who did not always see eye to eye on thing that had great impact on the growth of our country. In order to make the events as real as possible, each lesson will use as its central element a primary source document. These documents will be presented in their original form whenever possible, but will also be offered in other, sometimes more usable forms. A student can use almost any United States history textbook for background information needed to place these events into historical perspective; however, these lessons will provide other materials that can replace the use of a text. Because some teachers may feel that they do not have the background in this subject to adequately teach it, additional information has been provided to augment their understanding of this subject. Teachers who are not history teachers or who feel that they are not as familiar with the subjects will find suggested readings that might be done to better acquaint them with the subject which might make them feel more comfortable teaching this content. The unit is made up of three lessons. The first addresses the events that led up to the passing of the Kansas – Nebraska Act, primarily the plans for the building of the Railroads to the West. The next lesson deals with the attempts to populate the new territories after the bill was passed. The last lesson approaches the long-range effects on the development of the United States that the Bill had. How was the issue of American slavery dealt with politically from the writing of the Constitution to the American Civil War? Students will be able to list the major events that led to the American Civil War. The Impending Crisis: 1848 – 1861, David M. Potter; The New American Nation Series; Harper Colophon, 1976. Chapter 7A Railroad Promotion and its Sequel; Chapter 9, Two Wars in Kansas; as well as other parts of the book. Bleeding Kansas and the Enduring Struggle for Freedom National Heritage Area Challenges facing the new Territories concerning expansion of slavery.